Like Magento Go, Prostores and other promising carts before them, Amazon Webstore has decided to end its life wilfully. Cart’s officials have announced Webstore’s shutdown in July 2016, so, now, its soon to be former users are anxiously seeking for a decent platform replacement. Pursuing that goal, they compare different solution’s features, read characteristics and experts reviews, but, sometimes, it only leads them to confusion. So, if you’re also puzzled with a platform choice, the infographic below should help you sort things out. 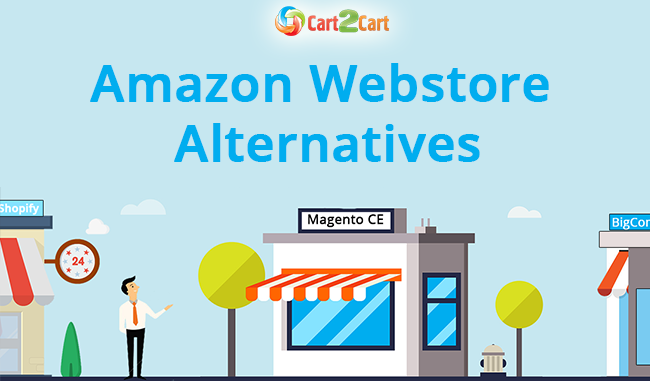 Cart2Cart team has made a special list of the Top Amazon Webstore Alternatives, on the occasion of platform’s closing. So have a look, and make a deliberated business decision. In our opinion, all the uplisted solutions are great alternatives to Amazon Webstore. However, we’ve only mentioned four platforms, whereas there hundreds of them on the market. So, keep our recommendations in mind, but conduct your own research to find an ideal platform. However, If you have found the desired cart already, we can transfer your data to it -- from Amazon Webstore to Magento, Shopify, Bigcommerce, Prestashop or any of 70 other supported platforms -- without losses. So, stop hesitating, register at Cart2Cart and perform a safe transfer right now.